All week we have been reading and writing poetry in the library! The second grade students had a chance to write a poem involving alliteration. 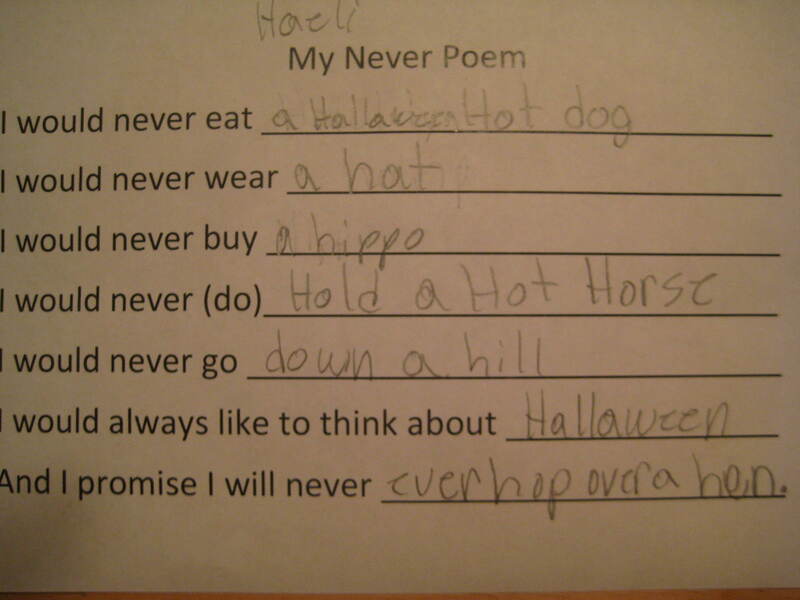 I found a pin on Pinterest that led me to an entry on WriteShop.com called ” ‘Never’ Poems: Write a Silly Poem” by Kim Kautzer. It is silly and the children had a ton of fun writing and reading their poems. We have 4 second grade classes at my school, so I had the opportunity to modify and adapt my instruction as the week went on. Of course, the last class went the smoothest and was probably the most successful. I like to think of this as perfecting the process for next year! First we discussed what the students knew about poetry and I mentioned that repetition is common in poetry and alliteration is also found in poems. I found that the students had an easier time writing if they chose a consonant and just brainstormed words that began with that letter first and wrote them down. They then worked from the list they wrote. After working with two classes I decided we needed to have dictionary and thesaurus on each table for those that got stuck or couldn’t think of enough words. The students had a good time writing these poems. They would tickle themselves when reading them and just laugh out loud! How fun to hear laughter in the library. I chose the best poems and had those students record themselves using Flipgrid. We pay for a subscription to Flipgrid and it is worth it! Flipgrid provides the students with an opportunity to videotape themselves and quickly see the results. It also gives the students an authentic audience. After I finished recording each class, I emailed the link to the teacher so that all the students could see the videos of the poems.